we're not really into plays and musicals and ballets, but we do love to attend live classical-music concerts and performances. so when we were invited to watch "rent" during press night last wednesday, we decided it was about time we saw this multi-awarded broadway musical. we've never seen it before and only have a vague idea of the story, so we had no expectations whatsoever. and while we can hardly consider ourselves an expert, we do have an opinion of what we saw that night. the songs are very powerful with lyrics that speak from the heart and that one can easily relate to, and the music is engaging and catchy. and while the performers were all technically proficient, we felt they still had to really sink their teeth into their roles. they lacked soul and depth. are they relatively new and inexperienced in musical theater? or was it just nerves? also we didn't feel the chemistry between the characters. maybe because it was their first performance before a legitimate live audience. hopefully as the play goes on, this will improve. but go see it! these mediagenic talents are stars-in-the-making! and see it for the wonderful songs. in the pic above, they're singing "seasons of love," one of the most poignant songs in the play. Rent!!! Whenever I think about this play, I get reminded that I never managed to watch this when it was first staged in Manila, coz I chose to go off to Baguio with some guy!! Grr! Now the guy is no more, and I still haven't been able to see this live. Haay! Details Later and I went to watch the opera this was based on (La Boheme) around a week ago. It was an experience, though I think it wasn't a good introduction to opera. I love the songs in Rent also! "Seasons of Love" is the best! Though doesn't the subject matter feel so very 90s? Did it hold up to time? Rent has a lot of great songs, indeed. I do have a funny relationship with this musical (and you know I love to watch theatre) - when I saw Rent the first time, it seemed the actors' performances did not live up to the cast recording that was most peoples' introduction to the play. Parang, that's how the characters came off on stage? That's the ending?? (I loathed the ending!) Minus 100 points in the Details Later pantheon. Then I watched the Monique Wilson/Calvin Millado/Ricci Chan staging (in 2002? 1999? Don't remember na! ), and the story seemed to make more sense and the characters more sympathetic (and the ending still felt wrong to me, but my loathing for it was decreased at least). 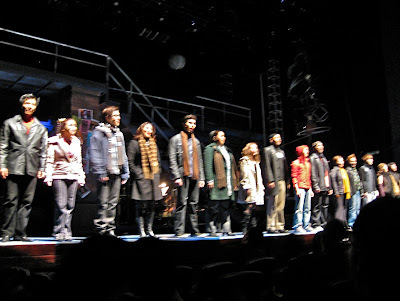 Which goes to point of your blog entry: as great as the songs are, Rent's ultimate success really comes to how the actors can bring those songs and characters to life. I know the same can be said of ANY play, but I feel it's particularly so for Rent. c_w, good point about the subject matter being so 90s. that's probably another reason why perhaps the young actors could not "feel" their roles as passionately—they weren't around when AIDS seemed to be spreading like wildfire and instilled a lot of fear in people. d-l, as someone in the audience said, ano ang storiya? that's just it, there's no story. it's just a year in the life of a group of starving artists (or trashy new yorkers, as another member of the audience said). so wag ka na maghanap ng storiya! i love rent. always have and always will. saw it 3 times once in ny and twice in manila (monique wilson/calvin millado/ricci chan HANDS DOWN over the crew with jm rodriguez--horrid!). however i completely agree that it's so 90's. THANK YOU cynical_witch for nailing my feelings about the play. it's for that reason that i have neither the desire nor the inclination to watch it again. That's the same plot in the opera too, thefashpack — the bohemian life, and the price these kids pay to live it. Vignettes lang nga siya. But at least the kids in the opera were making light of their penniless situation, and got creative. The Rent kids, however moaned about it and blamed "the man" or whatever.